The Book Brock was created in summer 2015. In collaboration with John Davy, the famous Dyker from Scoraig, I wanted to make a stone bookshelf for my ceramic books, i had lots of different ideas and thought of many places on the croft for possibilities… finally John and I walked round the croft to find the place , yes this would be good and this place and so on – we then arrived at the place it stands now , we both immediacy exclaimed “this is the SPOT” !!! the most inaccessible spot , on a little pointed hill ,with a great wives out to the head of loch Eriboll , ben Hope looking down on the right and Ben Spioarnaied on the left ,, we looked at each other :yes it has to be a kind of circle , like the Wheelhouse, a Brock —- that is it a ‘Book Brock’….. John the genius Dyker , went for a spade , and with his bare hands a wheelbarrow and his little radio hi started the Book Brock… it was finished a Month Later . 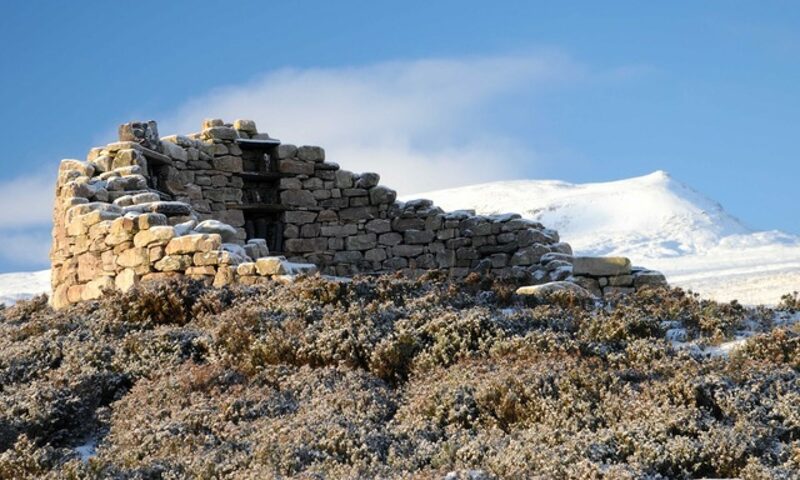 I am sure it was meant to be there, perhaps there already was one build by the vikings … At midsummer the sun comes op at the mouth of loch Eriboll lighting up the books, facing in line with Orkney. When The book Brock was finished and John had create a little pass up behind the brock to gather his rocks from a largs pile , there was still rocks left over, ,,, I have always loved the ideas about looking down in to the ground being it holes or wells …”John can you make a Hole in the ground lined with rocks and a mirror at the bottom to catch the sky “! Yes hi said … it was finished summer 2016, like magic. In collaboration with *Kris Alan, i am upset with Light, I had for years a pile of old glass blocks from the streets of Glasgow ,which I was given to me … I thought of many ways to use them wanting to catch and contain the light ,,, especial in the dark winter month …. the tower of light cane in to my mind — kris who was helping me on the croft helped me to create them .. They catch the early morning light and late afternoon light as though the light is sprouting out of the ground in winter frosty mornings they send out a strong glow of hope.